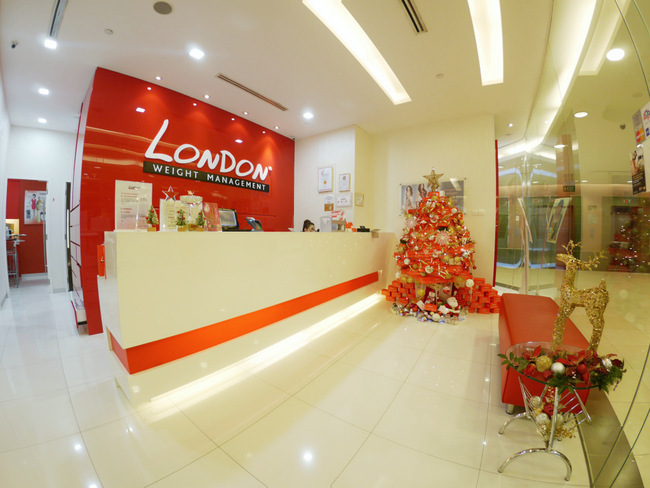 London Weight Management branch at Ngee Ann City, Level 5. Cellulite. A problem I face despite my age, active lifestyle and having drowned myself in green and herbal tea (it’s supposed to help). I have been visiting London Weight Management at Ngee Ann City to tackle the unsightly bumps on both my thighs. With 9 sessions down, here is what I think of their treatment. Always with a smile, it is not just business over there. The treatment can have several segments and can take quite a while. They make sure to keep you feeling good with casual conversations, magazines and whatnots. As for arranging appointments, they were very helpful in adjusting to my rather flexible schedules. I can make changes or reschedule a day before. Before you write me off as an irresponsible patron, twice of which were due to my periods. It is not recommended to go through with the treatment then, as it may lengthen the duration. Still, my consultant was kind enough to change around the dates even when I threw this to her on the eleventh hour. They have several treatments and all depending on my needs. It is not just based on my weight that very day. They do take into consideration how I have been doing and was done in the last session to determine what treatment I should do that day. In the middle of a lavender sea salt scrub and Infra-red Warm Blanket treatment. Besides my cellulite, I have an intense water retention issue. Just look at my records, I can lose that much water weight with just 30 minutes of Aromatic Steam Bath and 30 minutes of Lavender Sea Salt Scrub in Infra-Red Warm Blanket. Just today, I managed to drop 1.1KG. My personal consultant, Mandy, explained to me that part of my diet and how I drink water was affecting it. I get that, with Christmas celebrations, my salt intake is on the higher side. (It’s those hams!) But, I was sure I drank enough water. The problem was that I drank huge amounts at once. I should, instead, keep hydrated throughout. Otherwise, the water would just pass through, and not be absorbed by the body, resulting in water retention. As for my true nemesis, cellulite, more sophisticated machinery was needed. Known as the Electrical Muscle Stimulation, it starts off with layering my target areas – thighs and underarms – with a Thermo Trimming Ampule, continued by stimulation through gentle electric pulses for about 30 minutes. It results in an instant reduction in circumference and stimulates up to 24 hours of fat burning. This is followed by a detoxifying Herbal Scrub and Lymph Node Massage to rid the body of the toxins from the “fat-burning” step carried about previously. I sure gave LWM a huge headache as I did my treatments during this season of feasting. I even took a trip to Koh Samui mid-way, and enjoyed every last morsel of Thai cuisine it could offer me. My gluttony definitely showed in my following session, but it took about three sessions to get me back on track again. Looks like they helped my dodge a bullet there! As of now, the cellulite on my left thigh has subsided. The chunk on my left thigh has softened, is looking a lot less wrinkly and has gone down in size. Something that I have not managed to do even when I increased my work out or focused on my thighs if anything it got bigger cause my muscles added on the bulk). And, this was all done with no invasive procedures and minimal pain (cue memories of my first lymph node massage). I still advocate an active lifestyle, a good diet and so on. But, if you have a problem like me that just can’t seem to go away, you might have a shot at LWM. Of course, before you head over, do check out my previous know-how post; 5 Things You Need To Know Before Joining London Weight Management. Give LWM a try, a free one at that by logging on here. Worth S$368, it will include 1 complimentary Full-Body Slimming Treatment and 4 Slimming products.